New Delhi, India -- A new study has suggested that sustained training in mindfulness meditation may impact distinct domains of human decision-making, enabling them to make decisions rationally . Ulrich Kirk, research assistant professor with the Human Neuroimaging Laboratory, Read Montague, professor of physics at Virginia Tech and Jonathan Downar, assistant professor with the Neuropsychiatry Clinic and the Centre for Addition and Mental Health at the University of Toronto conducted the study. Their research showed that Buddhist meditators use different areas of the brain than other people when confronted with unfair choices, enabling them to make decisions rationally rather than emotionally. The meditators had trained their brains to function differently and make better choices in certain situations. Using computational and neuroimaging techniques, Montague studies the neurobiology of human social cognition and decision-making. He and his students recruited 26 Buddhist meditators and 40 control subjects for comparison and looked at their brain processes using functional MRI (fMRI) while the subjects played the "ultimatum game," in which the first player propose how to divide a sum of money and the second can accept or reject the proposal. The researchers hypothesized that "successful regulation of negative emotional reactions would lead to increased acceptance rates of unfair offers" by the meditators. The behavioral results confirmed the hypothesis. But the neuroimaging results showed that Buddhist meditators engaged different parts of the brain than expected. "In meditators, the anterior insula showed no significant activation for unfair offers, and there was no significant relationship between anterior insula activity and offer rejection. Hence, meditators were able to uncouple the negative emotional response to an unfair offer, presumably by attending to internal bodily states (interoception) reflected by activity in the posterior insula," explained the authors. 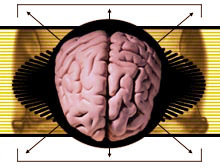 The study was published in the April 2011 issue of Frontiers in Decision Neuroscience.